With the transfer window in Indian Football closing on the 15th of February , the last few days saw a flurry of activities by I-League clubs with Sporting Club de Goa, Ai? ?Rangdajied United,Ai? ?Mohammedan Sporting, Churchill Brothers and United SC being in the thick of things. With the business end of I-League fast approaching the deadline day transfers could play a major role in shaping out the outcomes this season. Ranti Martins‘ loan move toAi? ?Rangdajied United is without doubt the pick of the winter transfers and could change the complexion of the relegation fight this season. Martins is a proven goalscorer in I-League having finished as the leading goal-scorer for the last three seasons and is capable of changing matches on his own. Last season he scored almost at goal per game and played a huge part in United SC s impressive form. This season however he has not looked his best with United SC s financial problems playing Ai? ?a part in it. However he has shown glimpses of his talent throughout the season notching up some important Ai??goals. Rangdajied United are struggling at the bottom of the table and the twin losses to Dempo and Churchill Brothers have not made things easier for them. In both matches the team failed to score despite creating several chances. Ai? ?Edmar Figueira has been well below par and the injury to Manandeep hasn’t helped the team’ s cause. They badly needed a striker and have struck gold in form of Martins who has tremendous experience of playing in the I-League. Martins will be crucial part of the team’ s plans in the remaining eight matches as they look to survive the drop along with three other winter signings – Susanth Mathew, Steven Dias and TP Rehnesh. United SC meanwhile have filled some of the void created by the departure of coachAi? ?Eelco Schattorie and star players Ranti Martins and CK Vineeth.Ai? ?Ananta Kumar Ghosh has been appointed as head coach while George Telegraph’ s Nigerian strikerAi? ?Adekunle Owolabi Wahid has been roped in as a replacement for Martins.Ai? ?Two time NFL winnerAi? ?Subrata Bhattacharya has also been appointed as the Technical Director of the team.Ai? ?The club has also signedAi? ?Arjun Chatterjee, Suraj Mondal from Southern Samity, Bivas Sarkar from Pathachakra besides promotingAi? ?Jagannath Oraon from the youth team. City rivals and newly crowned IFA Shield championsAi? ?Mohammedan Sporting completed their foreign quota by signing 34 year old strikerAi? ?Taro Hasegawa who brings with vital experience of playing in the J League. Taro was signed after he impressed coach Sanjoy Sen in the trials. The striker is expected to provide options upfront to the Black Panthers who till now have been dependent only on Josimar. In Goa Federation Cup champions Churchill Brothers completed their foreign quota by signing defenderAi? ?Daniell Zeleny, who couple ofAi? ?seasons back plied his trade with Mohun Bagan. The 25 year old who has been signed fromAi? ?Kaya FC, a club in Philippines, is expected to provide much needed stability to Churchill’s defense, especially with the AFC Cup coming up. Sporting Clube de Goa have also replaced Spanish midfielderAi? ?Arturo Garcia, who picked up a serious knee injury in the Federation Cup with Nigerian midfielderAi? 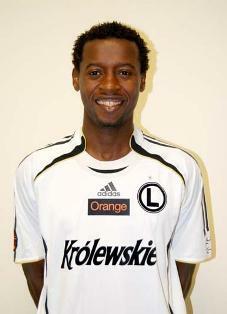 ?Martins Ekwueme who brings with him the experience of playing on the Polish top division. The 29 year old is expected to lineup alongside Ogba Kalu in the heart of Flaming Oranje midfield and help Sporting consolidate their position at the top of the table. In addition Sporting have also notched up MumbaiAi? ?Tigers duo of midfielder Roystan Dai??i? ?Souza and defender Chinta Chandrashekar to launch themselves for a serious title challenge. Dempo took onAi? ?Rangdajied United in the first match of the round at Goa and coach Arthur Papas fielded the same eleven as he did against Sporting Clube de Goa in the Federation cup semi-final. Ai? ?Rangdajied, who started without any of their two foreign strikers, were on the backfoot right from the start and were punished in the 7th minute when Alwyn George tapped in a rebound after Clifford Miranda’ s shot had hit the upright. Afghan skipperAi? ?Haroon Amiri made it 2-0 on the stroke of the half-time from a Beto corner.Ai? ?Rangdajied looked more lively in the second half withAi? ?Yohei Iwasaki and Kim Yong but Dempo goalkeeperAi? ?Laxmikant Kattimani put in an impressive performance to deny the visitors any hope of the comeback. With this win Dempo moved toAi? 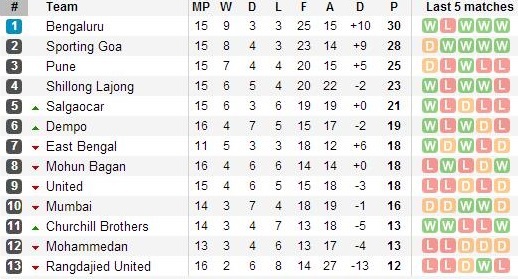 ?19 points while the Santosh Kashyap coached side remains at the bottom. Salgaocar took on Mohun Bagan and Nigerian strikerAi? 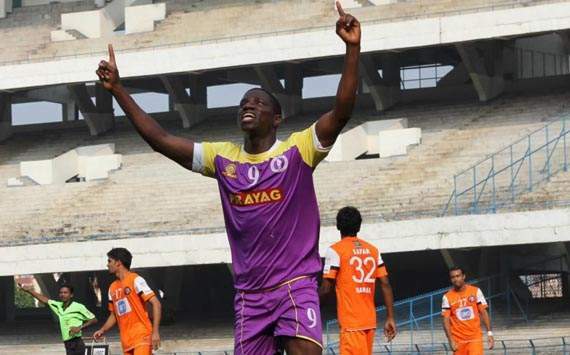 ?Dudu Omagbemi marked his return to I-League after seven years in style as he scored the winner in his team’ s 1-0 win over the Mariners. Salgaocar started with Darryl Duffy and Dudu upfront while Odafa was missing from the Bagan squad due to an injury. The home side started on the offensive and it took some splendid saves from Shilton Paul to deny them a goal in the first half. Dudu scored the only goal around the hour mark after he was found by Gilbert Oliviera. Stung byAi? ?the goal Bagan went on the offensive but profligacy in front of goal cost them yet again. With the win Salgaocar moved to fifth spot while Bagan dropped to the eight spot.Ai??Ai? ?Karim Bencherifa has his task cut out as his team have failed to score in absence of Odafa Okolie. Pune FC played host to Sporting club de Goa with both teams looking for a win. Pune started with only two foreign players in form of Douhou Pierre Ai? ?and Calum AngusAi? ?while Sporting were without their SpanishAi? ?midfielder Arturo Garcia who has been released following an injury. The match started on a high tempo with both teams looking for an early goal but it was the visitors who went ahead in the 39th minute.Ai? ?Beevan D’ Mello took advantage ofAi? ?Zohmingliana Ralte’ s slip to score from the edge off the box. Pune FC started the second half on the offensive withAi? ?Anthony D’ Souza and Gabriel Fernandes troubling the Flaming Oranje form the wings. Pune’ s persistence paid off in the 56th minute when strikerAi? ?Thongkhosiem Haokip headed home Anthony’ s cross. With the draw Sporting remained on theAi? ?second spot while Pune continued to be third.